Front cover of Russell Braddon’s Woman in Arms: The Story of Nancy Wake. 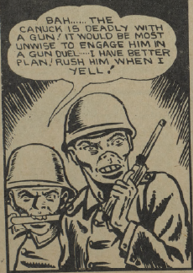 Traditional war heroes of past literature have often been associated with the memories and images of brave and strapping young men, ready to do battle on the field with other brave and strapping young men. Russell Braddon’s Woman in Arms: the story of Nancy Wake, abridged junior edition published in 1963, turns the traditional ideal of a war hero on its heels and introduces us to the life story of one of the most decorated servicewomen serving the Allies’ in the Second World War. Title and author on the book’s spine. Photograph taken by Samantha Ruinsky 2014. 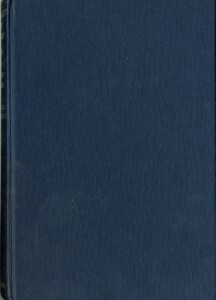 The physical edition of Russell Braddon’s book is found in the Children’s Literature Archive Collection at Ryerson University, published in London by Collins in 1963 (originally published in 1956). Its genre falls into several categories, including non-fiction, biography and history (WW2). There are only a few images in this book, including a map of France and scans of photographs of Nancy and her friends, allies and fellow servicemen. In relation to the greater topic of Children’s Books and War it is important to look at the influence Wake’s story had on those reading the novel when it was published, and those reading it today. 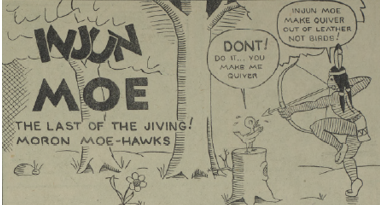 Looking at Wake’s influence as a celebrated heroine of World War Two, and by looking at resources such as newspaper clippings and historical accounts, the authority of women in the war effort will develop as a crucial approach to the theme of Children’s Books and War. In order to stipulate the books contents into the larger umbrella theme of children’s books in war, it is important to understand its context and specifics about certain aspects of the war, pertaining to the events described. By looking at certain ideological such as gender and sexuality, understanding the context and the meaning of the book becomes important as we can begin to understand the books intentions on its audience. By asking questions about gender roles, masculinity, and issues surrounding power and authority, we can begin to understand this books critical role in the discussion of its position in the theme of children’s books in war. World War II as a war fought between the Axis Powers and the Allies (Britain, the Soviet Union and the USA), after Germany had disregarded accordance’s with the Treaty of Versailles, invading Poland and other Eastern European nations. Germany refuses to leave Poland and Britain declares war in September 1939. In 1940, 3/5 of France fell to Germany in rapid succession, while the rest of France was established as a neutral state with its government at Vichy (Wright, 2013). 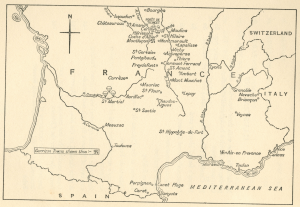 The Vichy Government was a pro-German puppet to administer unoccupied France and the colonies. The Maquis, with whom Wake worked with closely with for years, was the underground patriotic movement in France from 1939-1945 (Hoad 2003). 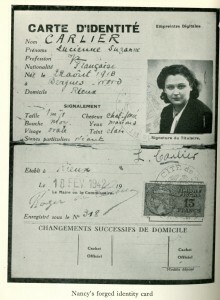 Photo of Nancy Wake’s Forged Identity Card, taken from the book, and photographer unknown. This Junior Edition of Women in Arms: the story of Nancy Wake is a small book that fits roughly in the size of your hand. The book itself is short (192 pages) and has 14 illustrations throughout, including maps, photographs of family, membership cars, and photographs of the real characters discussed in the book. The sources of the photographs are unknown as there are no captions describing such, and no extra notes provided by Braddon about its citation. There are no inscriptions in the inside cover of the front or back of the book, except the pencil scribbles of the book’s call number. The book follows the true story of a native New Zealander participating in the French Resistance movements and eventually joining the Special Operations Executive (a branch of the British Army), during the Second World War in Europe. With her work on the resistance front and as a British Agent, Wake, also known as the White Mouse as she ran laps around the Gestapo, became one of Churchill’s most highly decorated special agents (Willsher, 2011). The story starts off with a more than brief introduction into Wake’s emigration to France and her marriage to Henri, a wealthy industrialist from Marseille at the breakout of World War Two. With the occupation of France by the Nazis, Wake learns to drive a truck and becomes a courier of first messages, then later soldiers (Ward, 2000). She next gets involved with the movement of helping wounded or deserter soldiers exit France. Her fiery personality and natural ability to sweet-talk anyone and everyone within a 20-mile radius of her propelled her success and popularity amongst those involved in the resistance movement. 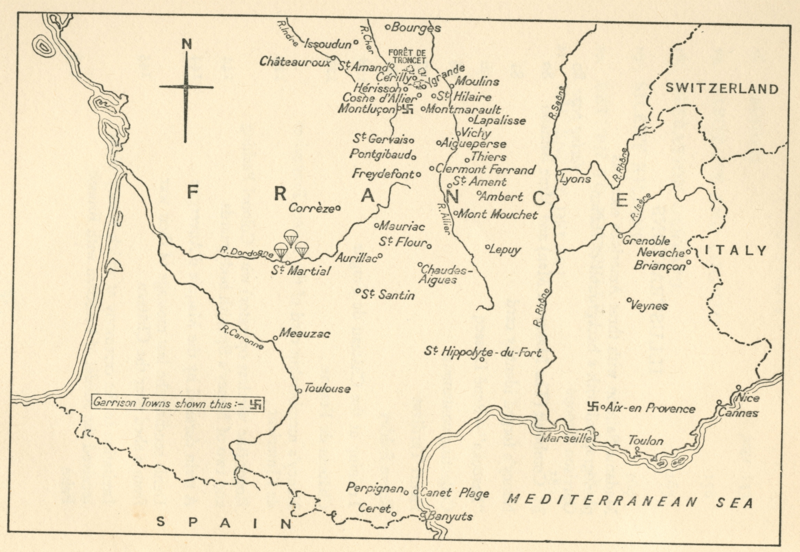 Map of areas where Nancy was during the Resistance Movement and fighting with the SOE. Image taken from the novel. Illustrator is unknown. Throughout this time she is arrested and questioned and ultimately released, weaving a web of intricate and detailed lies. 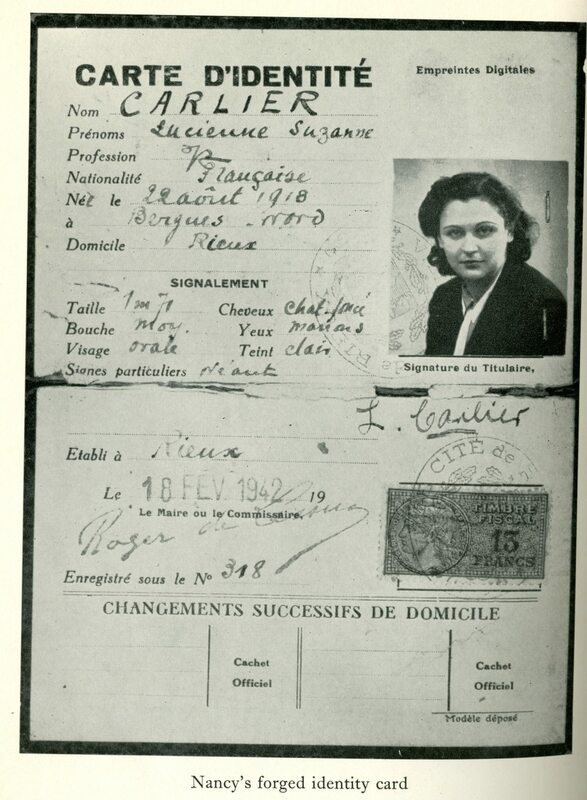 Once she became a well-known enemy of the Gestapo, she had to make an exit from Marseille to avoid capture. Travelling from Spain and eventually to London, she becomes involved as a British Agent working with the Special Operation Executive. After parachuting into Auvergne, central France, to organize the Maquis and its Resistance preparation for D-Day, Wake led thousands of men into guerrilla style warfare while inflicting severe damage on German troops and facilities. A year after Wake had left France, she learnt, her husband had been tortured and killed by the Germans, after refusing to give information on where she might be. (Ward, 2000). As Braddon concludes in the last chapter of his book, Wake remained in Paris until 1947, returned to the Australia of her youth, dabbling in politics of the Commonwealth Liberal Party, and eventually returning to Britain in the fifties, where she remained- completely unaffected by her high military awards from the United States, Britain and France (Braddon). Not included in the book because of its publishing date, but Nancy Wake died on August 7 2011 in a London Hospital, at the age of 98. “I’m glad I was there. I’m glad I did what I did. I hate ward and violence but, if they come, then I don’t see why we women should just wave our men a proud good-bye and then knit them balaclavas.”- Nancy Wake, Final Chapter in Braddon’s Book. Within the larger context of children’s books and war, Nancy Wake is a representation of a different take on a book for children about the Second World War, because of its lack of traditional characteristic’s children’s books generally have, such as colourful pictures, larger text, and a bright and vivid welcoming front cover. The fact that this book has virtually none of those characteristics allows it to become one of its own and stands out from what is commonly referred to as the children’s books. Advertisement in “The Times”. Image taken from The Times Digital Archive, under the section, Multiple Display Advertisements. 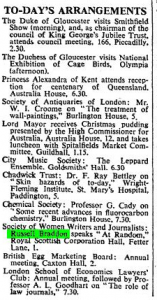 Published by The Times in London, England is an advertisement (see left) for a conference put on by “The Society of Women Writers and Journalists”, in which Russell Braddon was slated to present at. This speaks volumes of the novels response by women, as being chosen to speak at such an event becomes an important connection into discovering the books likability, as a woman’s story told by a man. 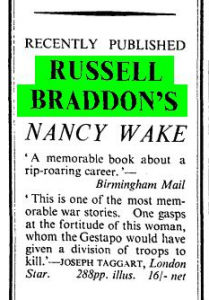 An Advertisment for Braddon’s book on Nancy Wake. Taken from “The Times Digital Archive”, under the section Index. Russell Braddon wrote this book in 1963, almost a decade after it was originally published in 1956 (See advertisement on the right). The book was published in a time when the world was in the middle of an inter-war period, with an almost imminent daily threat of war, between the continuation tensions of the Cold War and Vietnam on the brink of a civil war. The early sixties was also a time where gender roles and specifically the traditional role of a woman, was a continually discussed hot topic. The publication of this book and the story that it tells, become as I believe, a triumph for women in the discussion about “gender roles in war”, as it tells a story embracing a heroine, and showcases the strong willed and successful life of a female resistance fighter. The production of the novel was not something out of the sort for Braddon, as his specialty was in writing non-fiction and even more specifically non-fiction and war. His first novel was the retelling of his own story as a prisoner of war during World War Two by the Japanese (Starck 2009). Braddon himself met with almost every one of the characters Wake mentions in her story, travelling all over Paris, Nice, Marseile and London, who, as he describes, pieced together her story for me and brought back for me what they had known of her (Braddon 2009). 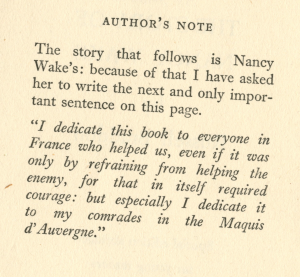 Author’s Note: A Message From Nancy Wake. Russell Braddon’s retelling of Nancy Wake’s heroic experiences in The Second World War is a story written in an inter-war period, for children and young readers with an appetite for a different and new perspective besides that of the traditional male soldier story. New research has found that children’s books are dominated by male central characters, creating a gender disparity sending a message to children that, women and girls occupy a less important role in society than men or boys” (Flood 2011). Braddon’s novel confirms the importance of erasing this message, and aims to provide a more inclusionary one to send to young readers. A Woman in Arms‘ crucial connection to the overriding theme of children’s books in war, familiarizes readers with the ever growing discussion regarding gender roles, by examining the expansive role of women in war time from all walks of life. Braddon, Russell. Woman in Arms: The Story of Nancy Wake. Abridged Junior Edition. St. James Place, London: Collins Clear-Type Press, 1963. Print. Ryerson University Children’s Literature Archive. Braddon, Russell. 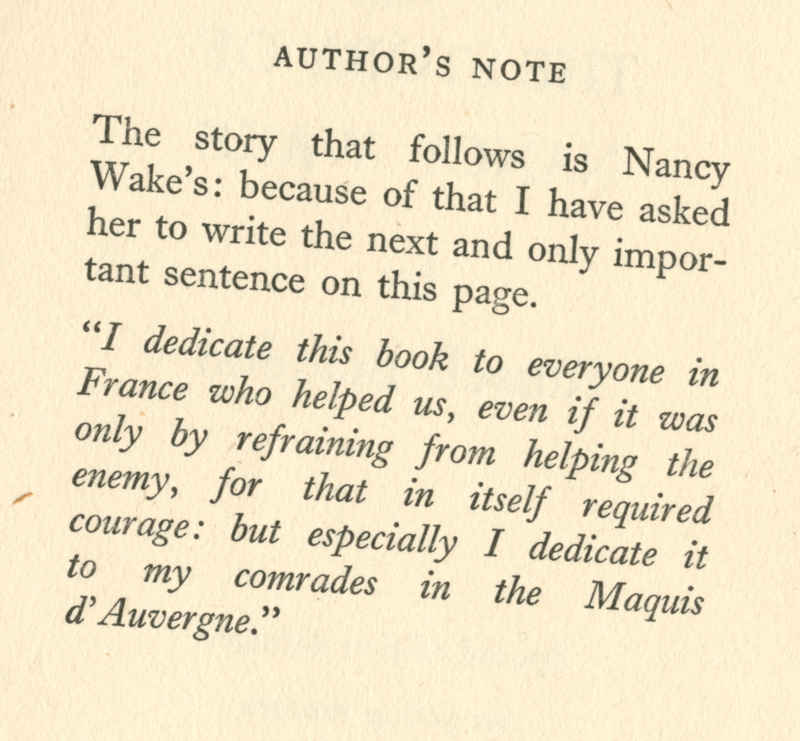 Nancy Wake: SOE’s Greatest Heroine. Gloucestershire: The History Press. 2009. E-book. Flood, Alison. “Study finds huge gender imbalance in children’s literature: New research reveals male characters far outnumber females, pointing to ‘symbolic annihilation of women and girls”. The Guardian. May 6, 2011. Accessed March 21 2014. Hoad, T.T., ed. “The Concise Oxford Dictionary of English Etymology.” Maquis Published online 2003: 1. The Oxford English Dictionary. “Index.” Times [London, England] 10 Dec. 1959: 13. The Times Digital Archive. Web. 22. Mar. 2014. “Multiple Display Advertisements.” Times [London, England] 22 Nov. 1956: 13. The Times Digital Archive. Web. 20 Mar. 2014. Starck, Nigel. “The Mind of Russell.” The National Library Magazine September 2009 (2009): 12–15. Print. Wright, Edmund, ed. “A Dictionary of World History.” Vichy government (1940-1945) Published online 2007 : 1. Dictionary of World History. —, ed. “A Dictionary of World History (2nd Ed. ).” Gestapo Published online 2007 : 1.